In strongly worded disciplinary reports released Monday, Interim Seattle Police Chief Carmen Best found that the two officers recklessly fired at the stolen car amid a breakdown in department policies. 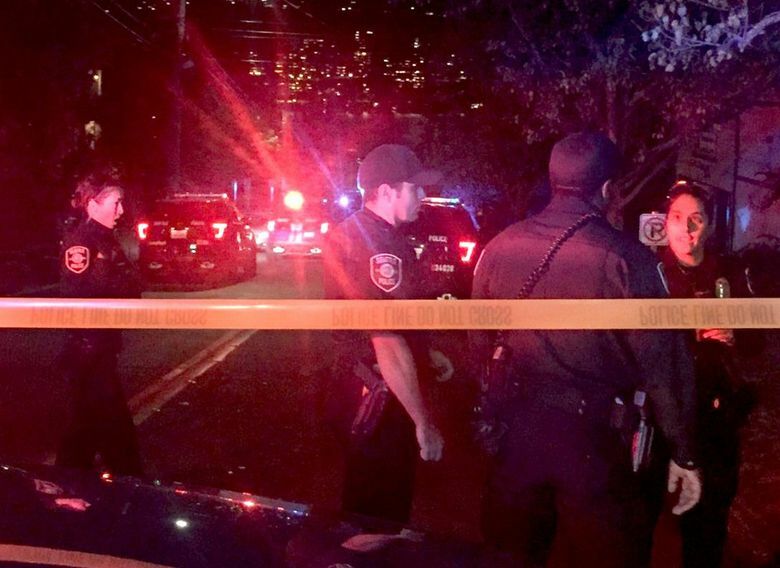 Two Seattle police officers who unleashed a barrage of gunshots at a fleeing car in the Eastlake neighborhood last year, wounding the driver and a passenger, have been fired after a lengthy internal investigation. In strongly worded disciplinary reports released Monday, Interim Police Chief Carmen Best found that officers Kenneth Martin and Tabitha Sexton recklessly fired at the stolen car after failing to follow department policies. Her decision comes less than a week after Mayor Jenny Durkan nominated Best for the permanent chief’s job and represents her most significant disciplinary action since Durkan appointed her interim chief in January following the departure of Police Chief Kathleen O’Toole. Although the driver and passenger weren’t seriously injured, the disciplinary reports and internal-investigation findings depict a chaotic scene in which the outcome could have led to unwarranted deaths or serious injuries and possible harm to bystanders who could have been struck by errant gunfire. The reports also revealed, for the first time, that a third person was in the car, although it is not believed that person was injured. Top department staff had recommended the firings of Martin, who joined the department in 2015, and Sexton, who joined in 2007. The two officers were notified of the chief’s decision in the last few days after separately meeting with Best to offer explanations for their actions. In firing the two, Best upheld the results of the internal investigation, conducted by the department’s Office of Police Accountability (OPA). It recommended the chief sustain violations of policies regarding use of force; use of deadly force against a fleeing person; firing weapons at a moving vehicle; and abuse of discretion. In an additional finding against Martin, the OPA concluded he failed to employ tactics to de-escalate the situation and, instead, made it worse when he ran, with his AR-15 rifle, toward the car and tried to block it. Best also adopted that finding. The OPA reached a determination of “inconclusive” on whether Martin and Sexton violated the law, although the OPA’s civilian director, Andrew Myerberg, wrote that the officers’ actions were “potentially criminal in nature.” He left it to prosecutors to make that decision. Top officials with the Seattle Police Officers’ Guild, which represents the two officers, didn’t respond to calls and emails seeking comment. Martin and Sexton, who were among four officers who responded to the Oct. 8 incident, fired 27 rounds into the fleeing car in an alley west of the 2200 block of Yale Avenue East. Video footage captured by officers’ body cameras and dashboard cameras was released by the department’s public-affairs office two days after the incident. Police had responded to a 911 call reporting two people using drugs. The caller said he saw one person holding a handgun, although he later told the dispatcher the object could be a phone, and that another person had what appeared to be a knife or screwdriver in his hand. The video shows officers moving toward a car, with one officer asking, “Is that them right there?” One officer yelled for one person to get on the ground, but the person runs toward the car. The video then shows four officers running toward the car, with one of them — identified as Martin — standing in front of the car and moving out of the way as the driver leaves a parking stall and heads north through the alley. The car hit a wall, reversed momentarily and then drove forward, the OPA found. Martin and Sexton fired a second volley into the rear of the car as it drove away, according to the OPA. While Martin recognized the car as one that had fled from him two nights earlier, he did not treat the response as a high-risk stop requiring planning or tactical discussion with the other officers, the OPA found. Rather than taking cover behind a vehicle and giving the people in the car orders to get out — creating time, distance and shielding — Martin ran in front of the car and increased his exposure, according to the OPA. By the time Martin fired, he had moved to the driver’s side of the car, out of its path, as it pulled away from him, the OPA found. Best, calling Martin’s initial 12 shots unreasonable, noted in her report that when Martin fired, no weapons were visible in the hands of the vehicle’s occupants, nor was the car headed towards him or others. Sexton’s initial shots were arguably justified because, from her perceptions, she believed Martin was in danger, according to the OPA and Best’s report. But the OPA and Best found no justification on her part or Martin’s for the second volley, concluding the car no longer posed a threat as it sped away from them. Best wrote that, under department policy, Martin and Sexton “should have allowed the car to escape instead of shooting indiscriminately” into the rear. With the car’s known license plate number, an arrest could have been made later, she added. Sexton, despite being the senior officer at the scene, took no planning or tactical steps, including the use of time, distance and shielding, Best wrote. The car was later found abandoned in North King County, and the injured driver and passenger were arrested Oct. 13 in Everett. The driver, Joshua Brooks, 21, pleaded guilty to possession of a stolen vehicle and was sentenced to seven years in prison for that offense and separate crimes, including burglary. His mother, Wendy Lee, 46, pleaded guilty to taking a motor vehicle without permission and was sentenced to 49 days of time served in the King County Jail. After their arrests, Brooks was treated at Harborview Medical Center in Seattle for two gunshot wounds to his lower back, and Lee for shrapnel in her lower back and legs. Lee told police that a third person, whom she wouldn’t identify, had been in the car but wasn’t injured or dead, according to the OPA. King County prosecutors conducted a preliminary review of the shooting, but tentatively declined to bring criminal charges against Martin and Sexton pending further investigation by the Police Department. With the internal investigation completed, prosecutors will take a second look at the case. Best, who is awaiting City Council confirmation hearings on her nomination to the permanent chief’s position, inherited the internal investigation case when she became interim chief. In a previous high-profile disciplinary case, Best earlier this year suspended for two days an officer who did not have his Taser with him when he and another officer fatally shot a 30-year-old woman, Charleena Lyles, last year. The officers said they shot Lyles, a mother of four children who had reported a burglary at her apartment, after she suddenly pulled one or two knives on them.